Place the sugar in the pan over a medium heat. Stir for 5 minutes until the sugar starts to melt into a molten copper coloured liquid. Add the butter and cream and keep stirring until the mixture is nice and smooth. 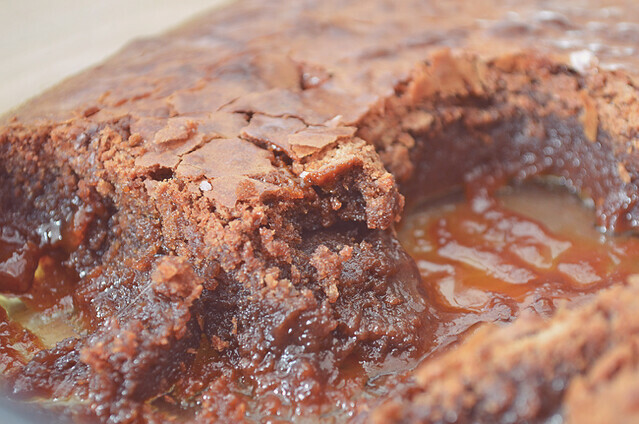 Stir until the caramel is bubbling away and all mixed in nicely (it smells delicious) Pour the golden bubbling pan of caramel onto a bowl with greaseproof paper and pop it in the freezer and wait for it to set! Yes.. It really is that easy! Preheat the oven to 180. Break up the chocolate into pieces and add it into a bowl with the butter. I popped them in the microwave and stirred them every 20 seconds or so until they had melted. Add in the sugar, eggs and flour one by one and mix them all together the mixture is nice and smooth. Then check on your caramel. 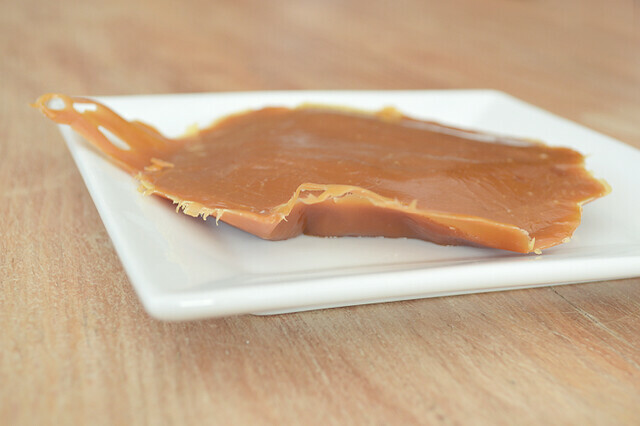 If it’s hardened peel it off the greaseproof paper and you should have something that looks a little bit like this..
Cut the slab of caramel up into little pieces (try not to eat too much of it whilst doing so, mmm!) 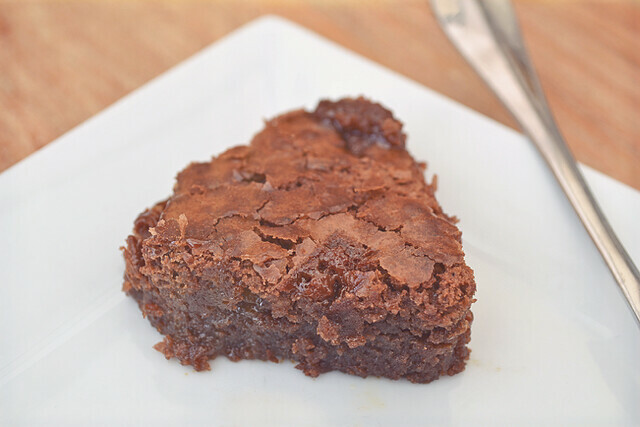 Then place the brownie mix into a glass baking dish and dot little squares of caramel all around the mixture.. Place the dish in the oven and leave to bake for around 30-35 minutes depending on the thickness of your baking dish. (I always use a wooden skewer to see if something is cooked if the skewer comes out clean you’re okay, if the skewer comes back wet with cake / brownie mixture, you will probably need to wait a little longer!) So.. now we wait. Find something to do in the meantime, pace around the kitchen or play Candy crush on your iPhone like me (that game is so addictive) Does anyone else get nervous at this stage that they won’t turn out great of if you take your eye off them for one second the kitchen will be engulfed in smoke? no? Just me.. okay then. I always set a timer too so I don’t forget. Once they’re done leave them to cool for 20-30 minutes or so and you should have something that looks like this.. behold the dish of chocolate-y caramel gooey goodness and cut out a generous sized slab.. I have to say..This picture here does not do the texture and taste of these brownies justice whatsoever. They are so, so moist. I think they’re served best whilst the caramel is still nice and warm. 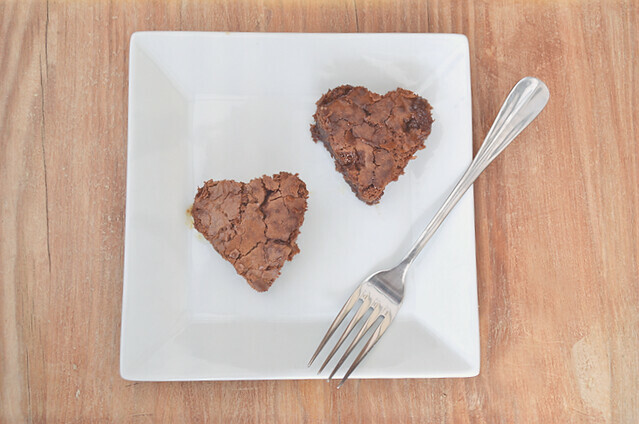 These little brownie bites are so gooey with thick caramel it’s probably a good idea to have a cold glass of milk nearby (you know, to be on the safe side!) What do you think? This is the first recipe I’ve made from total scratch in a long time. It really is very, very easy! Will you be giving these a go? If I can manage to successfully make these from scratch, you can too. Wow Becky, I will definitely be making these next weekend! Ohhh yummy, these looks and sound deeeelicious! I can almost smell them! I've tried to make brownies, and blondes, once, and they turned out absolutely terrible so I have never tried since! These sound so stupidly easy though, and the yummy caramel too! Seriously, when Dan and I get our own house I'm gonna find a huge kitchen and make my way back through all the recipes you've made until I'm too fat to leave the house. Really! Look delicious! But you have missed off the measurement of sugar you need for the actual brownies! These look and sound amazing! Will be giving these a go during the week. I'm a big fan of brownies. They look amazing! I can't believe you left out the salt though, salted caramel is the best eeverrrrr! Yummy recipe, can't wait to try it! Wow these look really really lovely! I cant wait to make them… 🙂 Thanks for sharing the recipe with us! OMG yum this looks delicious! I want you to send me a virtual slice! I've bookmarked this for later, they look amazing! My god these look incredible, when I get too big to be able to get out of the house- I am definitely blaming you. These look so tasty. I'll definitely be trying out the recipe! they look delicious! I don't think I've ever made brownies from scratch before! They look amazing! Yum! I tried your creme egg chocolate cupcakes and they turned out great! I love these recipes, keep them coming! My husband was up watching F1 too! I was sleeping soundly. Haha. He works on one of the teams, so it's a must-watch event. The brownies look amazing. Caramel is yummy, so this is a great combo! wowieee! These look so so so yummy! I must bake these soon, think they would go down a treat in my house. I also did some brownie baking on the weekend, posted it last night, mini egg and choc buttons gooey brownies! I need to make these! My mouth is watering just looking at the picture! !